Properties in Sandbar Golf average 4.8 out of 5 stars. Great Ocean Views Private Lane Steps from Beach $3850.00.p/w Must see!!! Property 6: Great Ocean Views Private Lane Steps from Beach $3850.00.p/w Must see!!! Ocean side, 2 Floor Condo, 3rd from the Beach with a fenced in Patio! Property 7: Ocean side, 2 Floor Condo, 3rd from the Beach with a fenced in Patio! Property 17: Seaside Park Apt w/Outdoor Shower- Walk to Beach! Great Location! Park your car and walk everywhere.!!! Property 18: Great Location! Park your car and walk everywhere.!!! Seaside Park Borough - Apartment Pet friendly steps to beach Ground Level. Property 21: Seaside Park Borough - Apartment Pet friendly steps to beach Ground Level. Location ! Location ! Location! Comfy Condo in center of Beach Haven! Property 33: Location ! Location ! Location! Comfy Condo in center of Beach Haven! 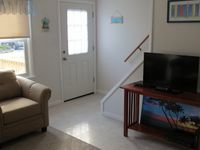 Cute and cozy 2 bedroom Brant Beach condo across the street from the BEACH!! Property 44: Cute and cozy 2 bedroom Brant Beach condo across the street from the BEACH!! Gorgeous Bayfront Condo w/Pool in the heart of Beach Haven. 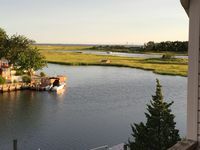 Property 50: Gorgeous Bayfront Condo w/Pool in the heart of Beach Haven. We loved our stay at this clean and quite Condo. The view is stunning! The area is very quaint and has all different stores close by. This was a great rental for a quick fishing getaway. The location is great for access to south side fishing locations both ocean and bay. We brought our kids as well. Nice 'kid room' with bunk beds, safe street as well. We spent a lot of time indoors due to the bad weather and didn't feel like the condo negatively affected that situation and we were comfortable lounging about there. I will definitely keep this place in mind for similar trips in the future.